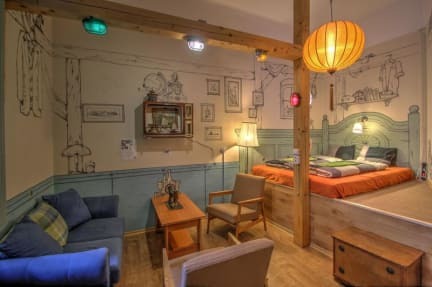 Lavender Circus Hostel, Doubles & Ensuites i Budapest, Ungarn: Bestill nå! A cozy,special atmosphere is waiting for you in a historical building from the end of the 19th century.In our hostel there are several kind of double bed and dormitory rooms available. The staff is ready to help you 24/7. We are specialized in 2 bed private rooms, en-suites and apartments.You can enjoy your privacy but you're also welcomed in the community room to meet other guests any time. Free WiFi connection is available in all of the rooms and the entire hostel.All of the rooms has an own, individual character designed by graphic designers, painters and sculptors. And you can enjoy the drawn vision of the owner on the walls. If you want, you can cook something in the kitchen. In our lounge there is always free coffee and tea as well and we organize Hungarian dinner parties where guests can try Hungarian pálinka or local wine and learn how to prepare traditional dishes. Bedrooms and community rooms are non-smoking!There is a comfortable special separated smoking area. Please note that these apartments are on a different location then the main hostel building. The address: 1066 Lovag street 22 . Earliest check-in is at 9 a.m.